Revenues grew by 11%, Rs. 359 crores compared to Rs. 325 crores in the corresponding quarter of the FY16. A growth of 21% and 34% respectively on year-on-year basis. EBITDA margin improved by 189 basis points to 22.4%. PAT margin improved by 188 basis points to 22.4%, compared to the third quarter of financial year FY16Total debt as on 31st December 2016 Rs. 681 crores. Long-term loans Rs. 219 crores and working capital loans Rs. 462 crores. Revenues up by 7% to Rs. 1,073 crores from last year. EBITDA was Rs. 230 crores, up by 15%. PAT was Rs. 119 crores, up by 32% compared to last year. Improvement in EBITDA margin by 157 basis points to 21.5% and PAT margin of 11.1% an increase of 214 basis points compared to the first nine months of FY16. Rs. 230 crores spent on CAPEX and Investments in wholly owned subsidiaries during the first nine months of the current financial year. EU exports account for 10% of the sales and are valued at Rs. 28-30 crores. Metformin is growing at about 14-16%. Dr. Prasada Raju is now an Executive Director in the board. Rs. 230 crores spent on CAPEX and Investments in wholly owned subsidiaries during the first nine months of FY17. Re-inspection from INFARMED expected to go smoothly. Inspection of JV in Vizag from US FDA. API segment contributed 37%, PFI 29%, FDs 35%of revenues. Auctus division contributed around Rs. 28 crores. Approval for cetirizine expected in the next 6-9 months. Till date 8 ANDA filings, of which 5 are approved and 3 are pending. In 2 months, 4-5 more filings from Hyderabad facility and 2 from US facility are to be expected. JV level sale was Rs. 49.7 crores. EBITDA number was Rs. 7.4 crores. Total R&D spending in the 9 months FY17 including capitalized amount, around Rs. 19 crores so far. Most of the expenditure will be done in Q4. Another Rs. 2 crores to be spent on filings and R&D. Capitalization of R&D expenditure will be Rs. 2.5 crores other than capital items. Rx marketing instead of OTC private label business. Revenue of Rs. 5.5 crores and PAT of Rs. 1.5 crores. Expected to do close to Rs. 80 crores to Rs. 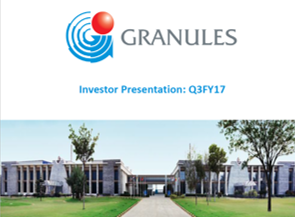 100 crores in the current quarter with at least a minimum of 20% EBITDA. No data integrity or falsification issues. In terms of growth, the current value is around Rs. 3.4 billion. Paracetamol can be sold straightaway. Metformin needs to get approved in ANDAs. Overall it is going to be about Rs. 300 crores to Rs. 400 crores on the full capacity utilization level. Biggest bottleneck is the API capacity. No pricing pressure as of now or expected. Empected time is 2 years for the costs to come down due to operating on the expected optimal capacity of 80%. Already spent around Rs. 360 crores in the first 9 months, balance to be spent in the next 15 months. Around Rs. 53 crores from promoters towards warrants money is expected before first week of March. Debt equity ratio is not more than 1.5, comfortable based on cash flows and projections. Based on the market conditions and future expansion requirements and other requirements, Board will decide and take a decision in the coming quarters, whether to go for equity or debt infusion. Greenfield API plant in Vizag is around Rs. 260-270 crores. The new plant will be operational from Q2FY18. An investment of US$ 30 million expected in US facility. Balance will be used for expansion of APIs and PFIs in existing facilities. Total CAPEX figure is Rs. 900 crores. Post expansion, APIs will go up for 1-1.5 years, followed by a gradual increase in FDs. Around Rs. 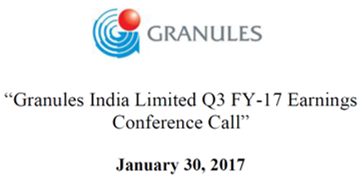 2 crores will be capitalized in the Q4. Yearly CAPEX and pre-operational expenses to be US $18-$20 million. Promoter’s Holding will be 53% after conversion of warrants, by end of FY17. 28% of Promoter’s Holding is pledged by end of FY17. Pending warrants from the promoters is Rs. 53 crores, which will be paid before the first week of March. Pre-operative current run rate will continue about US $1-$1.5 million per month. In terms of IMS numbers the Metformin global market is clocking at around 41,000 metric tons.Based on the market research reports it is coming closer to around 60,000 metric tons per year. Current capacity is at 3,000 TPA, 1000 TPA of which is outsourced. Glucophage has already been filed in FY17. 2 more products - Glumetza and Fortamet – to be filed Q3-Q4FY18. Merger of Liberty and FTUG. 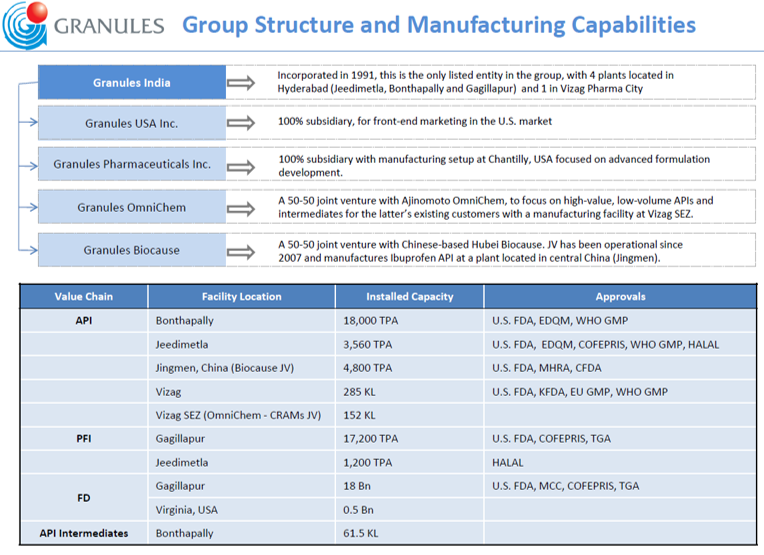 Parent company is FTUG – First Time US Generics. Current share in it is 12.5%. After the proposed CAPEX is complete the gross block will be Rs. 1,600 crores approximately. Fixed assets turnover to be targeted at 2 times, not immediately as it will take time to stabilize operations and get approvals. Initially API sales will be more, and then slowly it will be converted into finished dosages. ROE targeted at more than 20% for next 2-3 years, and 25% for the long run. For growth, JV will be the first opportunity, followed by API and then the FDs based on the ANDA approvals. The forth opportunity will be the new API greenfield plants being built in Vizag for onco and sterile products. For the first year the revenues of Rs. 200 crore and EBITDA of 20% is expected by only supplying to the Belgium partner. The market size for the 4 licensed products is about US$ 4 billion. Top line for FY19 roughly approximated to be Rs. 2000 crores. Omnichem is set for expansion to touch Rs. 400 crores in FY19.